“Although Chance doesn’t hunt with Dogs himself, I’m confident that Chance is quickly learning our Niche Hunting style. 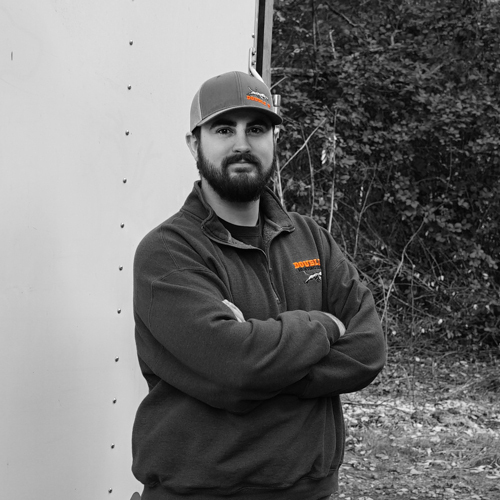 He has been and will continue to be a huge asset helping our customers troubleshoot and setup their hunting equipment. We are lucky to have him on the team!” -Owner Buddy W.
Chance joined the DU Team in January of 2017. With 8 years of experience in Sporting Goods customer service, we knew he was a great addition to the team. As a former Hunting Department manager (2013-2016) and then Store Manager for a major sporting goods chain, he knows what you expect and is ready to deliver. Chance has spent the last 9 years gaining knowledge and working with the gear we all use and love. In 2009, Chance moved to SW Washington from Oregon’s Willamette Valley. While in pursuit of his Associate in Arts Degree at Clark College, he fell in love with the Pacific Northwest. And with so many hunting, backpacking, and camping opportunities it’s no wonder why! He enjoys getting off the beaten path hunting and backpacking in his down time. And when he is not in the woods he enjoys promoting our traditions as sportsmen while instructing and working with youth in a shooting sports oriented Venturing Crew through Boy Scouts of America. His love for the outdoors shows through in his work. And while he is already an expert in a wide array of hunting products we all use and love, he continually strives to stay at the top of the game when it comes to new product education.